Not a very exciting blog post – but hopefully one that may help others. I have a set of Elinchrom Skyport Speed radio triggers – one transmitter and two receivers. Recently one of the receivers stopped working. The transmitter has a replaceable battery but the receivers have an internal rechargeable battery which you charge by plugging in an AC adapter. The malfunctioning receiver wouldn’t turn on. When plugged in to AC power the LED would glow as it should when charging BUT a lot dimmer than the working receiver. I tried to charge it well over 3hrs as described in instructions – but then after disconnecting the power it wouldn’t work. Wouldn’t even turn on properly when the AC was plugged in as I’ve read it should. I bought the set January 2011 so over a year ago and couldn’t find a reference to warranty period online so was worried that it would be out of warranty. However after mentioning the dilemma on Facebook, friends mentioned that under EU law electronics should have a warranty of two years. And sure enough – after contacting the retailer (Photomart) they said I could get it repaired under warranty – joy! After sending it to Photomart they sent it to The Flash Centre – the Uk distributor and service centre for Elinchrom who repaired it and sent it back. On it’s return there was a note (below) stating that the battery had discharged so significantly that it couldn’t regain power – interesting. The note was A5 and seemed pre-prepared as if this isn’t an un-common issue- and so I thought it worth blogging so others with a similar issue and googling the issue know what to do. It may be worth charging your receivers from time to time in the hope of preventing this also – or if you commonly only use one – to swap them. 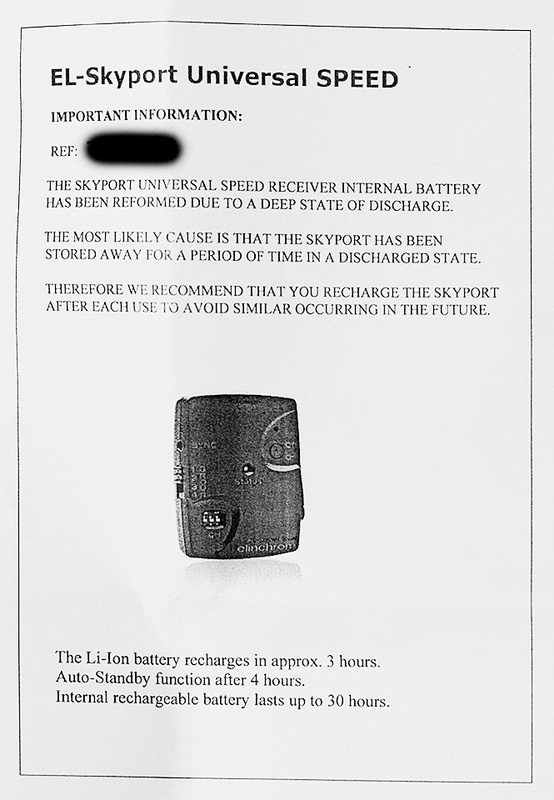 The Skyport Universal Speed Receiver internal battery has been reformed due to a deep state of discharge. The most likely cause is that the skyport has been stored away for a period of time in a discharged state. Therefore we recommend that you recharge the skyport after each use to avoid similar occurring in the future. Internal rechargeable battery lasts up to 30 hrs.